Samuel Pollock and Mrs. Julia Pollock about 1882 Washington, D.C. Photos sent by someone who found them in an antique store in Kentucky! I was quite intrigued to learn of my maternal grandmother’s Jewish roots since Connie McCoy was a practicing Episcopalian. The families of both her parents—Sam Pollak and Julia Wolner were Jewish and spoke Yiddish. (One of my grandmother’s sisters, Wilma Pollock, wrote The Upps of Suffolk Street, about a Jewish matchmaker named Kuppelman Upp, no doubt named for Koppelman Wollner, her grandfather.) Apparently, Sam and Julia decided that it would be easier to be Protestant than Jewish and were married by a minister. Nevertheless, Julia’s parents, Koppelmann Wollner and Caroline Fleischman, are buried in the Jewish cemetery, Salem Fields on the border of Queens and Brooklyn, N.Y.
Unbeknownst to me Sam Pollak's brother Ignatius (born Ignaz) continued to maintain his Jewish faith. Until my research, I never knew Sam had a brother, who had been a guardian of my grandmother after her father drowned. Ignatius Pollak, who continued to run Pollak’s Dollar Store in Montgomery Alabama, was a prominent Jew in Montgomery and Cullman Alabama. He was a successful business man and philanthropist in Cullman. 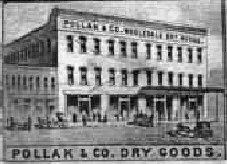 Picture of Pollak & Co. from a Montgomery Alabama Panoramic Map located inin the Alabama Archives, Montgomery AlabamaMy father’s mother’s family, the Pollaks, came from Austria to New York in the 1860s. Her great-grandfather, Samuel Pollock/Pollak, was a dry goods merchant who started the first dollar store in the South in Montgomery Alabama. He was the buyer for the business in NYC with an office on Chambers Street. The store was in Montgomery Alabama. It became The Montgomery Fair and eventually Dillard’s, which is still in operation as of 2007! 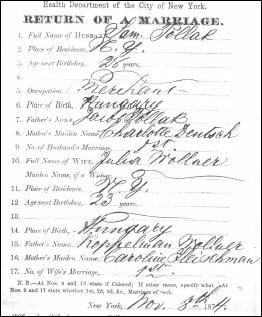 Marriage Certificate of Sam Pollak and Julia Wollner, NYC ArchivesSam and Julia began to raise a large family. By July of 1883 their children Albin, Rudolph, Alice, Wilma, and Irma Constance were born. Their youngest child, Semele, was conceived shortly before Sam drowned in front of the entire family in 1883 at the New Jersey shore. Semele who was born in April of 1884 was named for her father. (See my article on the drowning of Sam Pollak.) Five of the children graduated from college. Julia, who lived off Sam’s life insurance and properties, never remarried and outlived her husband by over 50 years! Samuel Pollak married Julia Wollner, who came from a large family who also emigrated from Austria to NYC in the 1860s. They were butchers who lived in lower Manhattan. Samuel Pollak married Julia Wollner in NYC in November of 1874. Sam was supposedly a 26 year old merchant, born in Hungary, the son of Jacob Pollak and Charlotte Deutsch. Julia Wollner was 23 born in Hungary to Koppelman Wollner and Caroline Fleischman.